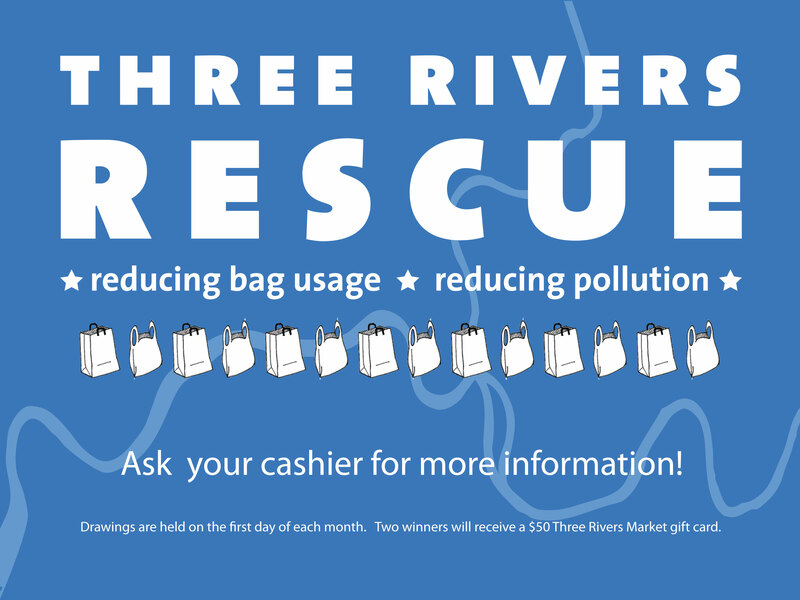 About: The Three Rivers Rescue program aims to reduce our paper and plastic bag usage. As paper companies and plastic bags have a long history of polluting our rivers and streams, this program will help us reallocate these resources to their protection. We hope to succeed by encouraging our customers to bring their own bag, or finding an alternative means of carrying their purchases. As a thank you to our customers for helping to keep our streams and rivers clean, we will reallocate our savings from bag purchases to customers. History: Our initial goal was a 10% reduction for our first year. In our inaugural year, 2014, we reached a 37% reduction in the number of bags used! We hope to continue reduction as the program continues.Aligning with our mission to create and nourish a healthier environment, people, and community the Three Rivers Rescue program will continue to further this. How to Participate: Customers can participate by bringing their own bag, carrying their items, or using a recycled box. When you choose to save a disposable bag, you help save our waterways. Upon checkout, ask your cashier for a Three Rivers Rescue punch card for a chance to earn a $50 gift card from Three Rivers Market. What’s in a Name? We are named after the confluence of the Holston and French Broad Rivers on the eastern edge of the City of Knoxville which flow from the Southern Appalachian mountains and combine to form the third river, the Tennessee River. Like the rivers for which we are named, Three Rivers Market nourishes our immediate community, our bioregion of the Southern Appalachians, and our region. For Policies and Rules please click here.